Fine motor skills are small movements that use the small muscles of the fingers, toes, wrists, lips, and tongue. 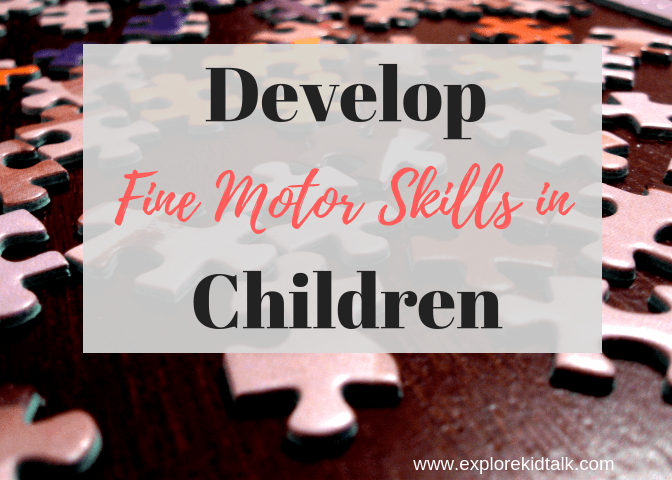 Even if your child isn’t showing signs of delays with fine motor activities by incorporating them into your child’s day will only benefit them. 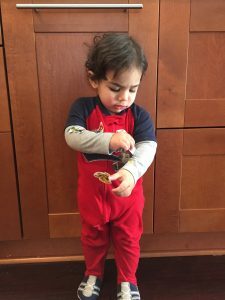 When children have a delay in the development of their fine motor muscles they have difficulty manipulating small objects, holding a pencil, and performing certain tasks. 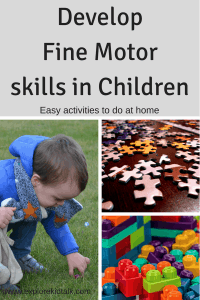 Therefore here are some easy, cheap activities to build fine motor skills. 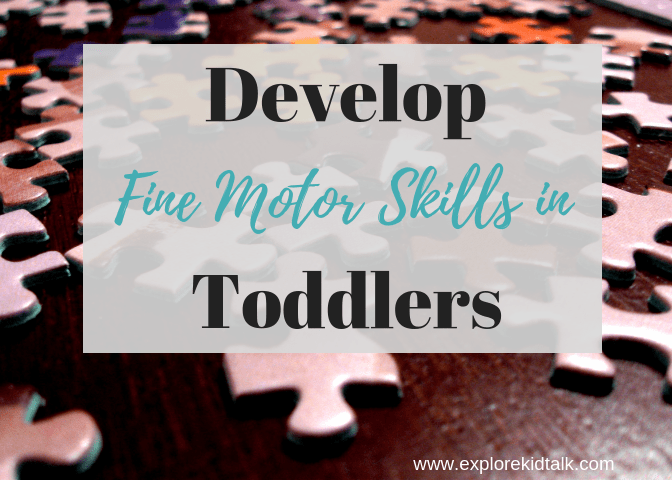 Sometimes it’s hard to know what to do to help your child build their fine motor skills. The best things to use are things that you already have. When building up those hand muscles you want to have fun in the process. 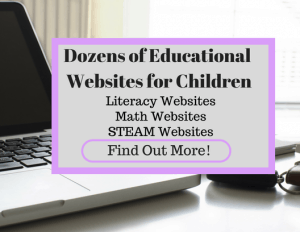 I have done all these activities both working with my students or with my own children. Here is a list of some activities you could do with minimal supplies. Most of these supplies can be found at dollar stores. Remember to think outside of the box and use anything you have. *Puzzles—Puzzles come in large formats with handheld pieces to small interlocking pieces. Here is a picture of a chunky puzzle. Children need to use their whole hand to pick up these pieces. The chunky puzzles are perfect for small hands. 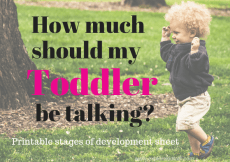 Start with the large individual pieces and keep moving forward as your child’s abilities improve. 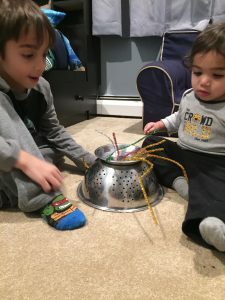 *Pipe Cleaners —Put Pipe cleaners in a colander. Turn the colander upside down and put the pipe cleaners through so they are popping out. Then turn the colander over and thread the pipe cleaners on the inside. This is harder because they have to cross over other pipe cleaners and put into two holes instead of one. Kids love that it’s silly and colorful. Pipe cleaners or straws could also be put into a Parmesan container. The top of a Parmesan container has two opening. One is the large opening which makes it easier to put the pipe cleaners into. The second has 3 small holes which require more control of the pipe cleaner. Two simple and easy activities. *Pom-poms—Pom-poms are small in size and excellent to work on the pincer grip (using your thumb and pointer finger). With pom-poms, you can pick them up and put into a bowl. Then pick up pom-poms and put into ice cube trays. To help teach colors you can have your child separate the pom-poms into the matching colored bowls. *Stickers—Oh the magic of stickers. Start by putting stickers on clothes. It’s easy to take them off. Make a game with your kids where you put the stickers. You can work on body parts using the stickers. “Take the sticker off your arm.” It’s fun and the kids love it. 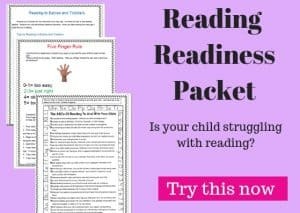 While your child peels the sticker off their arm they are crossing mid-line (crossing over the middle of their bodies to get something with the opposite hand). This is an important skill to practice. Have your child peel stickers off the page they came on. This practices precise motion. 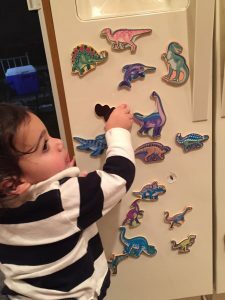 *Magnets—Magnets are a great way for your little one to stay close to you the kitchen and have fun at the same time. Magnets come in different shapes including animals, letters, shapes, and puzzles. You can find magnets in just about anything you want. 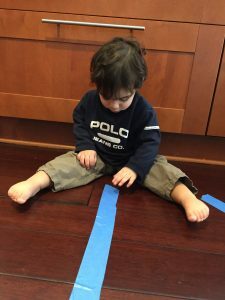 *Painters Tape—Stick tape to the floor or the counter and have your toddler peel it off. *Legos—Mega Legos are great toys for a 1-2-year-old. They are big enough for their little hands to pick up. Legos grow with your child’s abilities. 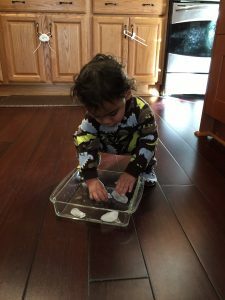 *Ice Cubes—Put ice cubes in a tray and let your toddler grab and pick it up. As long as they play on a clean surface it’s no big deal if they put the ice cube in their mouths (which they probably will). *Buttons—First, get a bag of colorful buttons and they can sort into ice cube trays, muffin tins or a container. Secondly, you can put numbers or colors on the bottom of the muffin tin or trays and have your child sort the buttons to get the correct number. *Blocks—Get blocks and start stacking. Stacking is the basis for building with blocks. If you don’t have blocks get pool noodles. Pool noodles can be cut up and used as blocks. They are a great alternative. 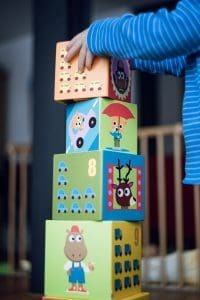 There are tons of toys that work on building fine motor skills. Though we will discuss toys another time. These are some suggestions that you can do at home without spending a ton. I know that most of these items are already in your home. Please add your ideas and things you do at home to help build fine motor skills. I’d love to hear your suggestions. This is one of my favorite toys for fine motor. “Do your kids have this? It’s a terrific toy for any toddler. I use one for work and just a few weeks ago my son got one for his birthday. I put this bank on his wish list hoping he would get it. I’m a huge fan of toys that teach multiple skills. That’s when I feel the toy is truly worth it and valuable for children. This definitely does that. Unlike other toys that want the child to put something in, this is not difficult. The coin can be turned either way so there’s no confusion for the child. That’s an important feature when I look for toys. I drive to children’s houses and work with them in their home. I need toys that have multiple functions as I bring all the toys to the house. This toy is something I’ve used for years. It’s now updated and even better. This Piggy bank is more than just cute. 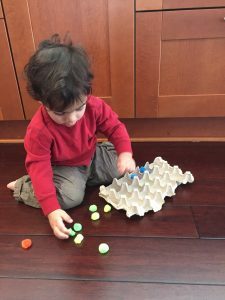 It sings songs, counts, and works on fine motor skills all at the same time. As my son puts the coins in I say the colors. This has 2 different levels that teach different skills. The coins are the perfect size for little hands. Get this for your toddler or as a gift for a toddler in your life. No idea how to entertain your toddler? 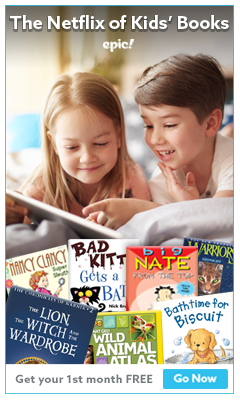 Looking for more ideas for things to do at home? 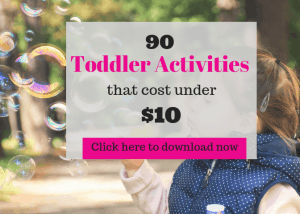 Get dozens of fun learning activities for your toddler here. 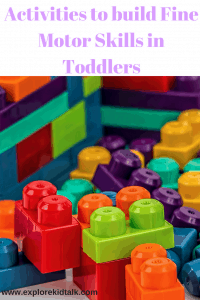 Click below to get your Toddler Enrichment Ebook today. PS. 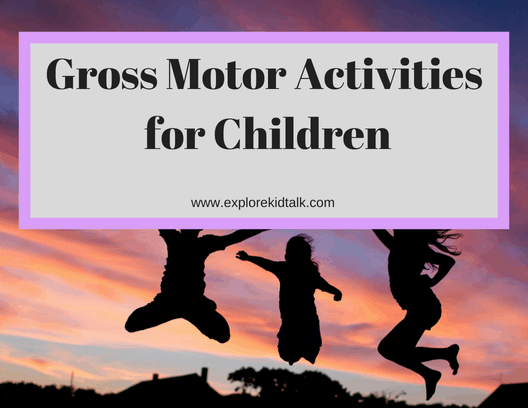 If you liked this post be sure to get more Fine Motor Activites that you can do at home here. 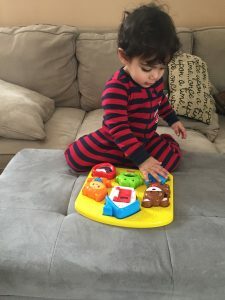 We’ve done a lot of these activities, especially the puzzles, blocks, stickers, and magnets. I’ll have to give the ice cubes and the painters tape a try too. Love how simple and inexpensive these ideas are! Thank you. I wanted to give ideas that people can do at home without having to spend much money. Let me know how it goes! My son loves buttons and pom poms for sorting. He also loves playing with cars on top of blocks. We make tons of roads and towers that are driven on for hours before the blocks must be smashed. Yes, knocking down the blocks is always more fun than stacking them up. I love it! Fin mottor skills are always good to build up and its so easy. We used lots of tools and began with cherrios . 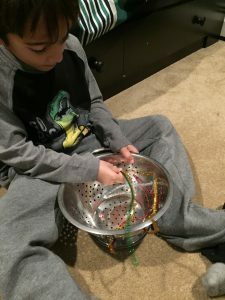 Pipe cleaners in a colander?!!! Oh my goodness so simple but so so smart!! *mind blown* I know what me and my little are doing tonight! You made me smile. I’m so glad you liked the fine motor activities for toddlers. 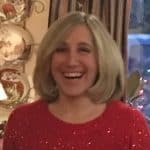 I try to give parents a way they can help their kids right at home without spending a ton of money. These are all activities I’ve done with my kids as well as the kids I work with. Enjoy. Let me know how it goes.